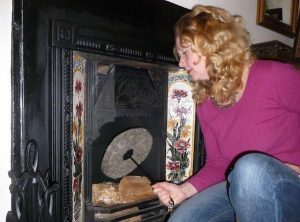 “There’s a bat in my house, and the only way it can have got in is down the chimney!” When I operated the bat helpline for Natural England, I received calls like this on a daily basis. It made me aware of just how many open chimneys there were. I researched further and found that chimneys are designed to draw air out of a property all the time. They don’t just work when the fire is lit and stop working when the fire goes out. They constantly pull air up and out of the building, removing all the centrally heated warm air in a room within an hour and causing cold air to be pulled in from around doors and windows, creating the draughts we notice. Thus began an obsession with chimneys. I stuck my head up every one I could get access to, measuring them all. Two things became clear: there are an awful lot of open chimneys in the UK, and there was little in the way of standard sizes. I realised there was a need for something that was versatile enough to block a wide range of chimneys sizes, that was easy both to put in and take out, that blocked the airflow but still permitted the chimney to breathe, and that wasn’t too expensive. The answer was all around me where I lived in Cumbria: wool! Wool is a natural insulator, is breathable, sustainable, compressive, malleable. It took a while to transition from idea to prototype to design to commercial product and there were a few trials and tribulations along the way. If you’re interested I go on about them a bit in some of the blogs. But I’m very grateful for all the help I received along the way. It reduces the number of air changes in a property so considerably reduces the amount of air pollution that enters the home. It will last for over 10 years with normal regular use.